"We're offering a product with a meaning behind it," JKO Collection Founder, Keith Ross. 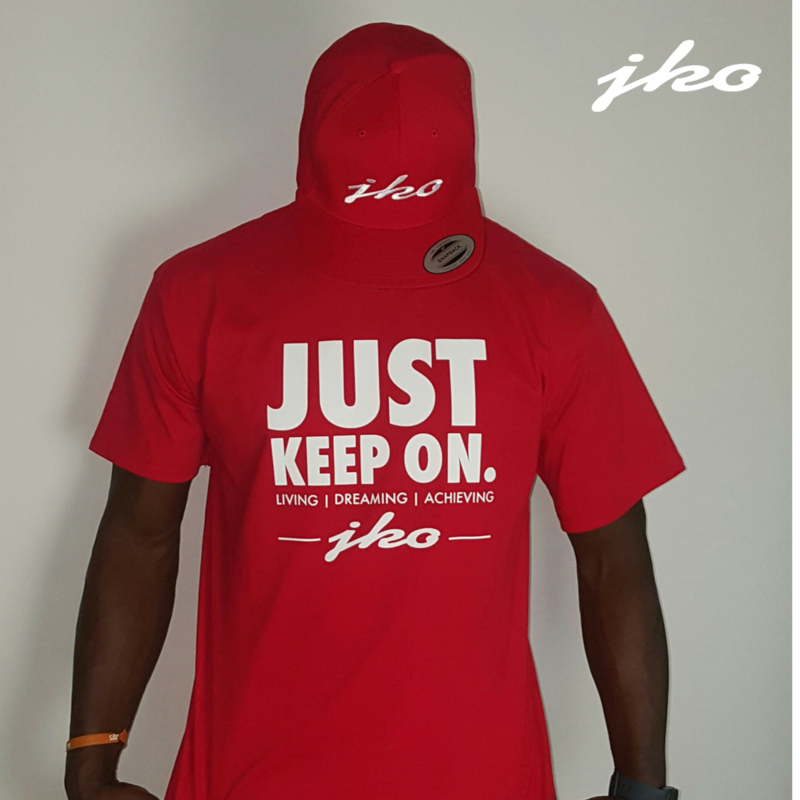 JKO maintains the mindset to "Just Keep On" and the company's founder wants you to "Just Keep On" with your goals, desires and efforts. In the past six months, company founder Keith Ross and the JKO Collection team have revitalized the company with a vengeance to meet new consumers and invite them to become a part of the JKO lifestyle. "My stepfather, mother and sister assists in many aspects of the company and also takes an active role in the creative process. I couldn't do this without them!" JKO Collection offers apparel for men and women and their colorful, suitable designs are available for your family, your ministry, your corporation and for YOU! In the beginning, there were two partners that worked strategically to birth a company. JKO Collection debuted in 2012 from the partnership between two Florida-based men, but it began at a slow pace. "We would work for a little bit and stop for a little bit" states Keith Ross. "My partner and I would work a little and I would work a LOT". Yet, in spite of consistent input during these early stages of the business, an attractive, cutting-edge "wearable apparel" was designed and a lifestyle concept is now groomed for the world. "I am a face-to-face person and I can introduce this concept through events and through talking to people in person. However, I know that I can't reach everyone, so I am inviting people to visit JKOcollections.com to learn more about our products". Wearable apparel is available in gray and black and in select school colors with many more color combinations for spring, summer and seasonal colors launching soon. A brand new concept named the Galaxy Collection is a family favorite in the wearable apparel line as Ross' younger cousin helped to give the purple and white shirt collection their name. Ross said, "Cousin, I need the purple, shiny shirt! I need that galaxy shirt!" and that's how we came up with the name. During my conversation with company founder Keith Ross, I realized that this man has been led down a strategic pathway to not only bring clothing to individuals, but to also share contributions from his family that have enhanced the concept of the original idea. JKO Collection originally was a partnership where the logo was designed and the apparel for men and women were offered. The partnership energized Ross and instilled a passion in his mind. Although the original partnership may have dissolved, Keith's creativity was sparked! His contagious enthusiasm blossomed through this transition, and the company never took a "side-seat" from his focus. The website has been redesigned, the apparel collection continues to grow and JKO Collections is ready to adorn the world. "We are looking for non-profit organizations to partner with as well as opportunities to share this lifestyle with others," stated Ross. "My cousin and my sister came up with the concept to "Just Keep On" just as this company has continued after the partnership disolved. My mother came up with the name 'wearable apparel' because our clothing may be worn by men and women during every aspect of life". The JKO Collection Lifestyle can be anything that pertains to you! Reading, traveling, sporting events... anything that pertains to YOU, JKO Collection is a part of that too! The JKO Collection brand image is on every piece of clothing and the clothing can be a part of every part of your life. The plan is to expand the wearable apparel line to soon offer a children's line, accessories and undergarments too. There are several different areas where the company plans to grow as well. Ross informed me that they brought their company to a Delta Bowl event and are planning to attend the Essence Music Festival as well. "If you have a type of dream or goal that you are going for, JKO Collection can be a part of that!" Keith says, "It has been a wonder to see the facial expressions when a consumer is first introduced to the product. We pretty much get the same reaction every time; people like the product and they LOVE the concept of Just Keep On. "They visit our (vendor display) space and enthusiastically filter through the items that we offer. Our products are made in America and the pressers do a pretty good job of preparing our products for the consumer." There are actually v-neck and slim fit shirts designed for women, with part polyester and part cotton blend. There are different fabric and textures of the designs for men and women. "We are in discussion now to offer shirts for sporting events, just as we did for the Pop Warner and local school opportunities we supported last year." Founder, Keith Ross looks forward to introducing you to the lifestyle that his partnership conceived and his family regularly helps to enlarge. Ross is offering a 15% discount to the readers of this article. Use the promo code JKO21 when you visit the website, JKOcollections.com to visit JKO Collections! Search for JKO Collection on Facebook and InstaGram. "I would love for people to know that we are building something for the future; something to create jobs for kids in the neighborhood to keep them out of trouble. We want to build relationships with people and to keep this lifestyle going." Encouraging to read positive things from young entrepreneurs.